Retro Graphics - A blast from the past. Gold/Silver/Crystal style graphics. Super Eevee - A very special Eevee with superpowers. 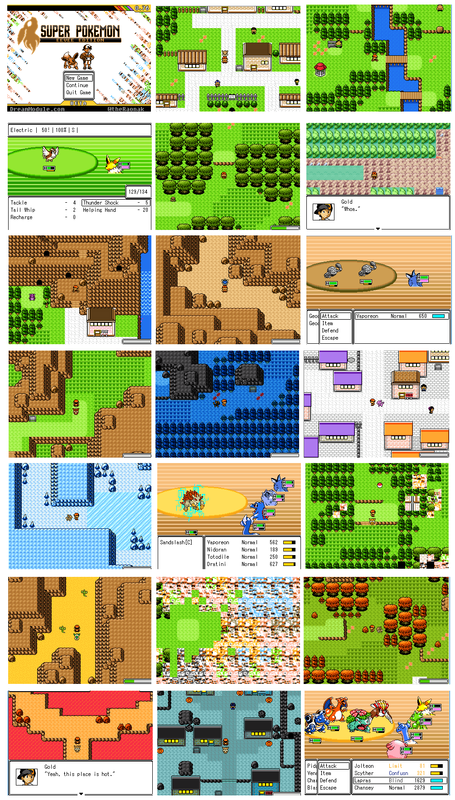 Active Battle System - A la Final Fantasy (well, most of them before X). 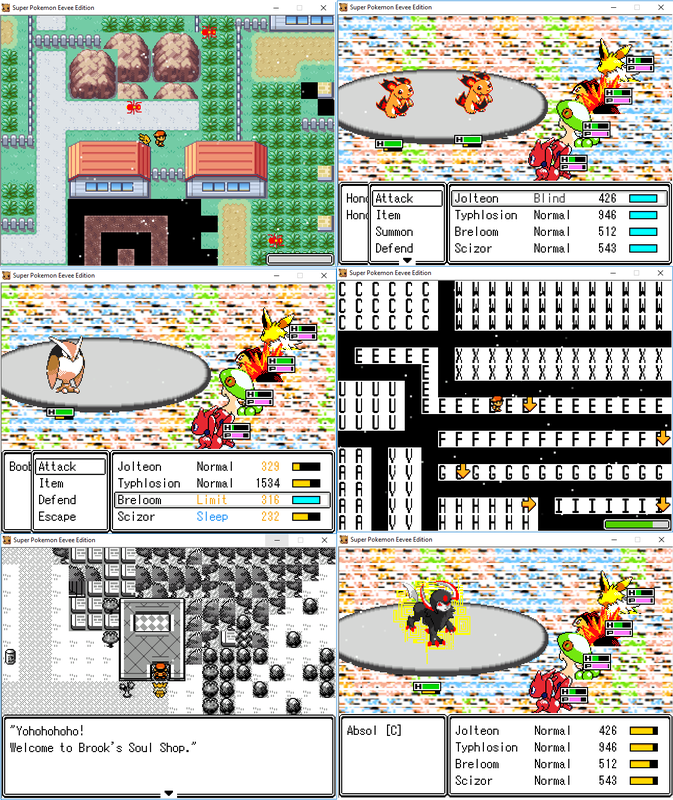 Four Pokémon per team - All four Pokémon are out on the battlefield and fighting. Corrupted Pokemon - Optional boss fights or side-quests are required to obtain Pokémon. Infinite Move-list - Pokémon are no longer limited to four attacks at a time. Sidequests - Get TMs, equipment, and other useful items by doing tasks for people. Refining System - Change useless items into powerful ones! Equipment - Equip certain items on Pokémon in order to to modify their stats. Trophies - Get notifications for completing tasks. Travel to the Code World - A dimension of graphical errors and home to the Hypervisors. Wow, the ui is just amazing and how the battle system works, reminds me of a certain game (Final Fantasy I think?) Anyways excited for future development! Hey, I remember played this and I really enjoy it! The battle system is engaging and I like the way you write the character's dialogue~ Maybe it's just me but I stop playing because I'm not used to the battle UI. It's rather dizzying for me to see that your pokemon is on the right side instead of usual left. Maybe it's just my own problem, but have you tried to flip it horizontally and compare which one is better from the two? Version 0.76 is finally available. You can use the existing launcher to update. But it will download a new launcher. Make sure to use new launcher after updating. Thank you, the battle system is quite fast paced, you can go into the menu and change it from Active Battle to Wait, which will mean when it's your pokemon's turn, the other pokemon don't charge their time bars. I would flip the graphics if I could, but it's an engine limitation. The 0.76 3 patch will be coming out soon. It will contain massive bug fixes, but I'm also going to add a new corrupted Pokémon.... or, to be more accurate, a corrupted legendary. I've also been doing work on the next story events, progress has been going quite well! If you update the game to 0.762, it should fix it. Fair enough, it is a lot more hectic than the normal pokemon battle system, so I understand having a hard time getting used to it. Windows throws that warning if it's a unsigned application. (AKA, any application that isn't made by a big company). Because there is a chance the developer of the app has put malicious code in there. It's a good warning for people who don't often download unofficial programs, but it does produce a lot of false positives. SPEE has no malicious code, or virus, or bad stuff. I have written the code myself and it's completely safe. There's a FB community if you want to verify, I've had thousands of downloads and no-one has brought up any issues relating to the safety of the application. Hello! I am here having FINALLY finished the entire game as of now (0.76)! 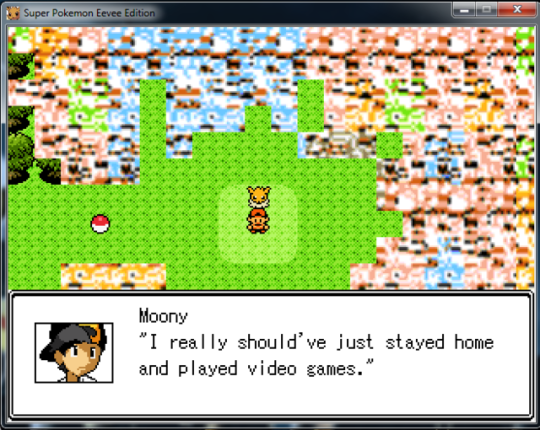 And, being a person with a tendency to break games, i have found a great number of glitches and other minor issues! So many, in fact, i had to start compiling a folder just to keep track of them all! I also should probably note that since i did beat the game, a number of my 'glitches' and all DO contain spoilers of the game itself. Just a fair warning; there is a reason i put these in a spoiler :P Bring out the Popcorn cause this is a long one. EDIT - added in another grammar error. Sorry for forgetting. 1; https://prnt.sc/k315bx Tree.exe has crashed. This wasn't in a glitch world! Almost none of these are!!! So with that glimpse of hope, i found more glitches... Get your popcorn ready folks! 3; https://prnt.sc/k322y4 Well my Vaporeon got stuck. 3.5; https://prnt.sc/k324lp Then my Vaporeon became the guardian of the cave. 4; https://prnt.sc/k32svp Not sure if this is glitch, but it almost became tradition for me to sleep on my pillow. 5; https://prnt.sc/k3526v I'm giving a plain badge? But to who??? I'm not Whitney! 8; https://prnt.sc/k3uyqc He's like, "Hello darkness my old friend..." And i'm like, "HELLO FROM THE OTHER SIDEEEE..."
9; https://prnt.sc/k3v7oc I actually don't know how i caused this one, but it did end when i went downstairs i couldn't do it again ;-; This was fun though. 13; https://prnt.sc/k3vm3u ZERO THE EEVEE, EVERYONE! 16; https://prnt.sc/k3vqer That rock though, seems oddly placed imo. 17; https://prnt.sc/k421qx Ember Pieces for WATER crafting materials? What. https://prnt.sc/k424qy Makuhita! Meditite! Makuhita! Meditite! OP team please nerf. (Just kidding, it's actually really lame) And i didn't really pay much attention to the levels of the other guys but.... https://prnt.sc/k425w9 . On the topic of Whitney... did you arrange Whitney's miltank to be level 30 something? Cause holy flip. Well least i beat it. 19; https://prnt.sc/k4322l Going up... https://prnt.sc/k4324q anddd this doesn't look at all like the same place! 21; https://prnt.sc/k43kei You can actually open the tailwind and keep it there, this will force him to skip a turn and allow your team's action bars to fill. 22; https://prnt.sc/k43w8s the fighting type badge? In the ice gym??? 25; https://prnt.sc/k445lf Why is she calling me Gold? I named myself Sapling here!!! 26; https://prnt.sc/k445h2 Not sure if this counts but M can walk on water .-. And that's the end of the glitches. BUT WAIT! THERE'S MORE! First off you got a number of spelling issues! Don't worry, i don't blame you for it, i just am here to point it out ^-^ i'm not the best at spelling myself. Please note also that after awhile i stopped screening the same errors over and over. 5; https://prnt.sc/k43qdk You mean, GeoSigma? 6; https://prnt.sc/k43qob PEOPLE IT'S GeoSigma!!! 7; https://prnt.sc/k357x3 Thoes? XD it's Those, oh and you got this wrong several times. 8; I didn't get a screenshot for this, but M: "You can't normally find code like this in your world." "It is only because my presence has created a bridge to the upper codi". Oh yes, i remember the Upper Codi. Great times. There is not much difference! They're just the original sprites but blue with red eyes (Or blood on the tusks with pilloswine). There's alot you could do with these pokemon! Maybe put spikes on Macargos shell... Or sharpen Steelix's spikes... There are also many other colors in the world you could easily use. And many other changes you could make to the pokemon. Another thing i'd suggest is stop relying on blood for these. Speciffically Pelipper and Trappinch. ESPICIALLY Trappinch. Anyway, in the end i really loved the game. Other than the few corrupt pokemon suggestions, i fully love the game and cannot wait for the next chapter; 1.8. I made a lot of screenshots for personal enjoyment, but sadly none about corrupted Furret, I'm sorry! Maybe you indeed should have done that. You'll have to enter The VOID, domain of Necro, the 4th hypervisor. It's a 7 floor labyrinth, a very bizarre place of deleted data. Hello! I am here having FINALLY finished the entire game as of now (0.76)! Thanks for the kind words and bug report, I'm fixing most of them up for the next update. Though, next time, could you state where the bug happened, some of those screenshots are vague, and i can't tell where it takes place. You are right about some of the corrupted Pokémon, I started phoning some of them in, as I had more pressing features to work on. I'll probably go back and polish up stuff like that in future updates. If you want any of the game's resources (such as corrupted pokemon), you can find them in the Pokemon Eevee/Monsters folder. Oh boy, the screenshots look indeed great with the Spaceworld-Betamon! These spiders in the first one catch my eye. I'm looking forward to the next update I really enjoy this game. Just wondering: Will the Update actually come with a new Mystery Gift as well? I've so looked forward to this. All it does when I run the NewLauncher is displaying a message saying that 'the launcher will now restrart', when hitting 'okay' it automatically downloads the Update including the whole Game. When starting the Game I can only select 'New Game' and 'Quit Game' instead of 'Continue' despite I head three seperate save files, there is no option to transfer or restore saves. Am I doing anything wrong?